I spied GapKids Adventure at my favorite spent shop and hoped that I had located the sequel to the Snow Day game, one of the first games from this Gaming Pathology project (and I know that such a game exists, and I know I will locate it one day). Alas, this is unrelated to Snow Day save for its GapKids theme and the probability that it was distributed in the same way as Snow Day (at various GapKids stores). My copy of the sleeve has the handwritten note “code 427” on the front of the sleeve. Will this game feature more of that GapKids trickery goading players to return to the store at set intervals in order to learn secret codes to access more games? The game sleeve is larger than a typical CD-ROM sleeve because it contains a pair of paper glasses similar to cheap red/blue “3D” glasses. However, these glasses have red tint over both eyes. I haven’t seen this technique since the tech specs found on the back of Transformers toy packages over 2 decades ago. I can’t shake the feeling that there must be some standard color adjustment tool found in many graphic editors which would allow you to undo the masking. 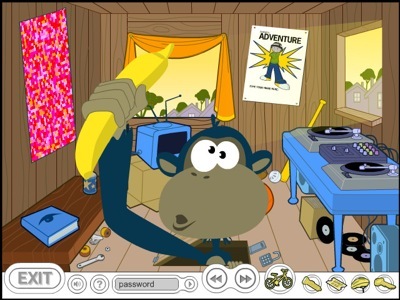 Anyway, the game, apparently written in Flash 6.0 circa 2002-2003, has the player selecting either a boy or a girl, dressing them, gathering useful items from their bedroom, selecting a mode of transport and heading over to the tree house after completing some athletic obstacle courses. 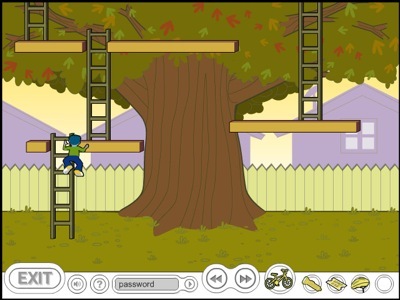 The ladder maze is platformer action which somehow manages to defy both the rules of real world physics (as all platformers do with their platforms moving to and fro in mid-air) as well as accepted video game physics (jump on a moving platform and the character remains stationary in air as the platform moves out from beneath). So I finally get to the tree house (the gameplay was arduous enough that I almost gave up). What’s inside? Well, we have an optical illusion book, a fortune teller fold-up that can be printed, a certificate of completion in the form of a poster that can be completed and printed, a DJ mix station activity, and a secret password that accesses a bonus half pipe game. Oh, and there’s also a compartment with a numeric lock. This is where the code that was scrawled on the sleeve (and was seen earlier in the game using the red shading mechanism) comes into play. What’s the hidden secret in the compartment? These kids are keeping a monkey prisoner in their tree house! It seems animal rights types would be all over Gap Inc. if anyone had ever heard of this game in the first place (Google searches only produce references to Snow Day). Also in the tree house is a video game system that offers 2 games. 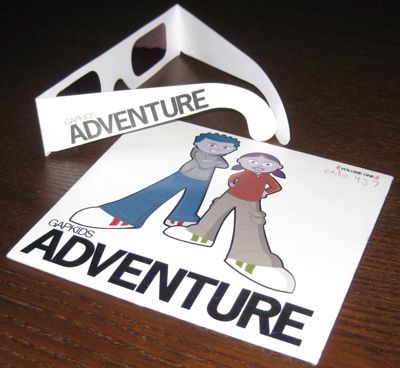 GapKids Adventure was created by a group named Orange Design who demo a number of Flash games on their site. I get the feeling that the 2 arcade games here are Flash games that they had laying around and thought this would be a good opportunity to publish them. One is a Lunar Lander-type game. Wouldn’t you know– here’s the exact Flash game on their website. 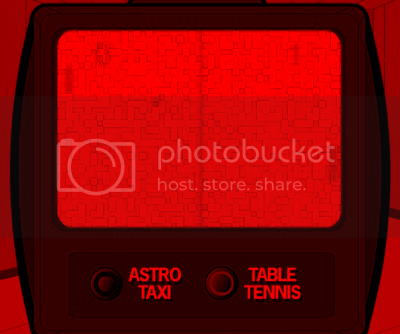 The other is standard Pong game with a twist– the whole game field is obscured by the same red masking as the clues, necessitating the use of the red glasses. 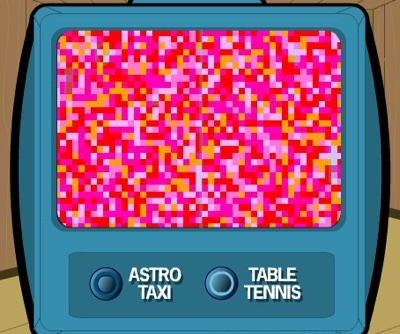 You might be able to sort out the clues if you stare at the static images long enough. But you’ll be lost trying to find the paddle and the ball in this field without the glasses. The game sleeve threatens that this is only Volume 1 so I will be on the lookout for more volumes. Or I suppose I could email the creators who still seem to be in business. Update:: Thanks to my contact at Orange Design who informed me that they only produced 1 volume of this game. I canâ€™t shake the feeling that there must be some standard color adjustment tool found in many graphic editors which would allow you to undo the masking. When light passes through a filter, the light is modulated by the color of the filter. In GIMP or Photoshop, load up the image and create a new layer over it. Make the layer solid red and set the blend mode to modulate. You can then see what is inside the image.